A new pioneer within gaming affiliation is putting together a new team that will create state-of-the-art affiliate portals. If you want to be part of a new and exciting company may this be the perfect opportunity to make a shift in your career. You will be leading a small but very successful team that generates online traffic for major iGaming operators. The aim of the company is to create well-known brands focused on sportsbetting (but also casino). With rich content (newspaper quality), unique AI algorithms (match predictions) and previous game data will the players be given a unique experience like no other existing affiliate portals can offer. As the project manager, you will be leading, coordinating and following up on the progress of the current websites and portals that are launched/about to be launched. The team will be completely new as well as the projects which will put your entrepreneurial spirit to the test. You will be encouraged to think about the team and the projects as your own “baby” to nurture and grow. The company promotes a flat organisation where titles and hierarchy don’t matter much but hard work does. You’re free to be who you are, express yourself and feel at home with the friendly team. At the end of the day is the only thing that matters results. Track project performance and report to other stakeholders. Analyse the successful completion of short and long-term goals. Follow-up on traffic- and link acquisition initiatives with SEO specialists. Work closely with the content department and freelancers. Share knowledge throughout the organization. We believe that you are an open-minded person that appreciates feedback, learning and constant development of your skills. You need to be a true team-player as you will work intensively within a small team, everyone helping each other out in achieving the best converting gaming affiliate portals in the world. 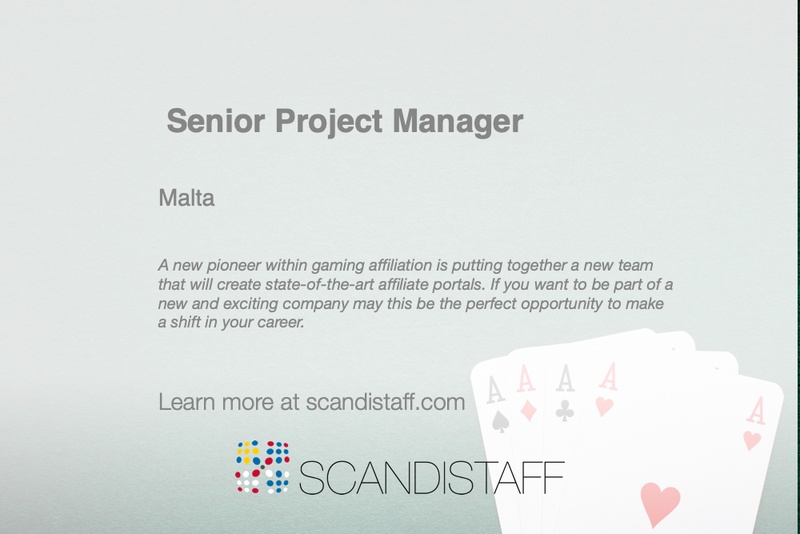 We also expect you to have experience from project management within affiliation and content (not necessarily iGaming). Furthermore, you’ll need a good understanding of SEM in general and SEO in particular. Last but not least, you possess a sharp business mindset. Results are why we go to work, we work to achieve our personal and professional goals.